Fourteen years before the Titanic sank, Morgan Robertson wrote the novella Futility. It was about the large unsinkable ship “Titan” hitting an iceberg in the Northern Atlantic. Both the Titanic and the fictional Titan did not have enough lifeboats for the thousands of passengers on board. Both were short by about half. 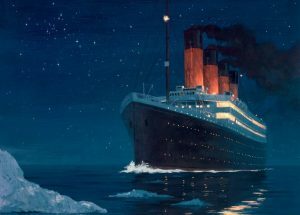 While the story behind the sinking of the Titan is somewhat different than the actual events of Titanic, the two are eerily similar, and with so many similarities, one has to wonder how this could have happened. It was like Robertson knew what was coming. The story of the Titan puts the “unsinkable” ship sailing through the north Atlantic at breakneck speeds, because as we all know nothing could sink such a ship. Any breech of the holds would immediately close the water-tight doors, stopping the spillover into the other holds. As Titan sailed through the icy waters, they came into an area of fog, and still they did not slow down. Watchmen were posted, one of whom, John Rowland, tended to indulge in drink, since the love of his life left him, and now somehow was on the same ship, and she was married and had a child. While Rowland had been drinking, he was still the one to spot another ship…not that it made a difference. The titan continued full speed ahead, cutting the smaller vessel in half and killing all aboard. The ship still didn’t slow down, and the captain tried to buy the silence of his men, but Rowland would not be bought. As the trip continues, things just get worse. Before long, the ship hits an iceberg, and enough holds are breeched to seal Titan’s doom. 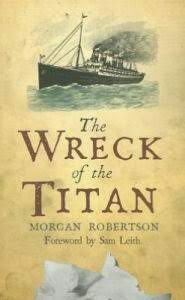 The book, “The Wreck of the Titan,” originally called “Futility,” was so similar to the events of the Titanic, that it was almost eerie, and yet, it was enough different that you knew it was not the same event. It was simply a “fact is stranger than fiction” situation, and no one could possibly have anticipated that a ship with a very similar name, loaded with people and half the necessary lifeboats, would sail at breakneck speeds across the north Atlantic during a time when the icebergs were floating everywhere, just like the ship in the story, and that the ship…Titanic would suffer the same fate as the storybook ship, Titan suffered, fourteen years after the author dreamed up the story in his mind. And yet that is exactly what happened. Wow! is that book still in print, or do I have to go to some elite bookseller. Good blog! and fact Is stranger than fiction. some of the stories that are true wouldn’t sell as fiction because They are too strange. I think it’s still out there. I got it on Audible.